Because not all acne is the same, treating acne will vary depending on what you’re working with, which makes it very important to learn your acne type, in order to determine the best course of treatment. 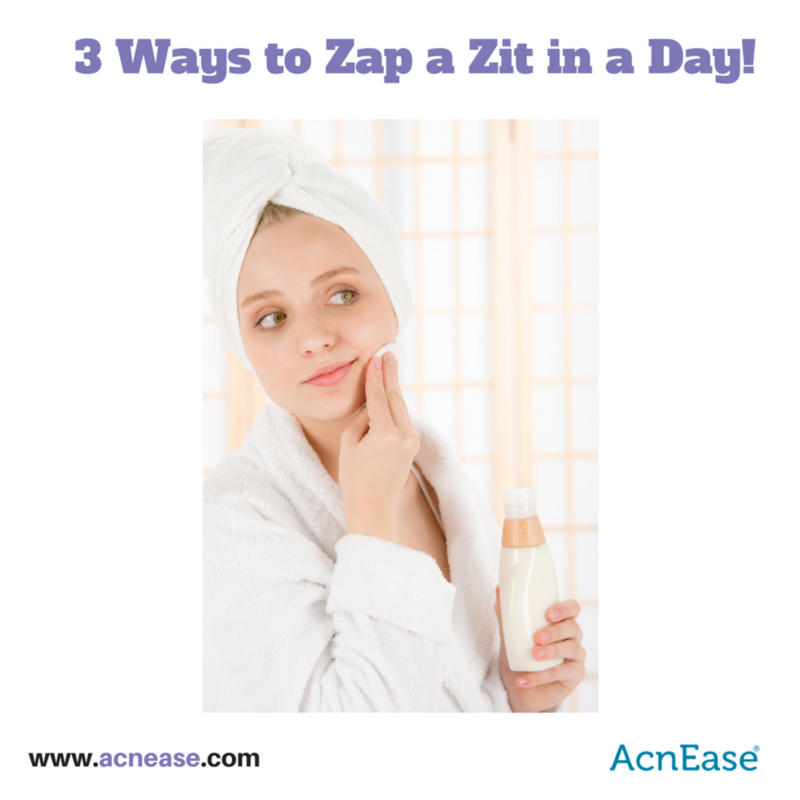 With all that in mind, we’ve come up with a three-step plan to zap just about any zit from your skin in no time! 1. Dry it out. The acne condition is most often blamed on an excessive amount of sebum. Produced by the sebaceous glands, sebum, or oil, travels through the pores to hydrate and protect the skin. When too much sebum is produced, which can usually be attributed to a hormonal imbalance of some sort, the narrow pores can become clogged, which can lead to breakouts. By the time a blemish has formed on your skin, it has filled with pus and harmful bacteria, which is why many topical treatments aim to dry those bad boys out. Finding an overnight mask or spot treatment designed to dry out acne will draw these impurities to the surface of the skin, making their departure that much quicker. Sulphur is known for its drying properties, as are charcoal and baking soda. Lemon juice, which is rich in vitamin C, can also be used to dry pimples by applying directly onto the affected area - just make sure it’s squeezed fresh, and not store bought, to avoid any added sugar. 2. Kill bacteria. Excessive amounts of sebum are only half of the problem when it comes to acne. Those red or white bumps we know as pimples are actually a response to a bacterial infection that occurs within the pores. When sebum combines with, dry, flaky skin cells, it produces bacteria. The body then naturally sends in white blood cells to “fight off” the infection, in a process known as inflammation. In order to keep acne from spreading, this bacteria must be eliminated. We can turn to simple ingredients you can find in almost any kitchen. Honey and garlic remain the main contenders in terms of homeopathic, anti-bacterial treatments, both of which are also naturally anti-septic, and anti-inflammatory. You can apply directly to the skin, or for a longer-term change to your skincare regimen, incorporate into your existing diet for a systemic solution to your acne. Tea tree oil also works well to eliminate bacteria, and can also be added to shampoos to reduce oils on the scalp. 3. Eliminate excess oil. Now that the blemish has begun drying out, and harmful bacteria has been wiped away, we’re left to keep oil production at a minimum if we want to prevent new acne from forming. Gently steaming the face is a great way to loosen up clogged pores and flush oils away, and a mask made of egg whites can help keep skin squeaky clean. Aloe vera also does a good job at sopping up extra oil, and because of its naturally soothing and hydrating properties, won’t further dry the skin. 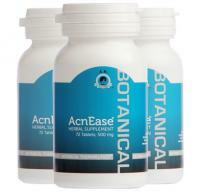 For a long-term approach to keeping oil production in check, addressing the problem at its source, (the sebaceous glands), is the best way to keep anyone from scrambling to zap a zit in a hurry :- and AcnEase does just that. Using safe and effective herbal ingredients, AcnEase works to create a buffer between the hormones and sebaceous glands, ensuring that only the amount of oil needed to properly hydrate the skin is produced - no more, no less. Combined with any of these topical treatments, a combination therapy with AcnEase will be sure to have you resting easy, and waking up every day to a clear complexion. When it comes to eliminating acne overnight, perhaps the most important tip is to remember this: be patient! Acne starts forming days before it reaches the surface of the skin, so giving it the time it needs to die a natural death (read: no popping!) will be the best way to ensure clear skin free of scarring, marks, or more breakouts! We want to hear from you! What is your go-to move to zap a zit in one day? Have any products or natural remedies to share with our readers? Tell us in the comments!